Chances are that if you are reading this blog, you already know who Clay Shirky is. If not, it’s probably a good idea that you do because Shirky is one of the leading voices in the digital space writing, consulting and teaching about the social and economic effects of internet technologies. In addition to being an esteemed professor teaching at NYU’s graduate Interactive Telecommunications Program, he’s also the author of the renowned book, Here Comes Everyone, among others. 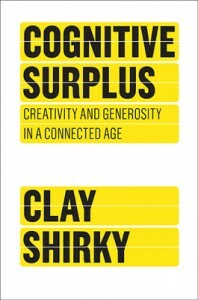 Two years after publishing Here Comes Everyone, Shirky builds on his groundbreaking thesis in a new book aptly titled Cognitive Surplus: Creativity and Generosity in a Connected Age. While the focus of his last book was the role that online tools played in the explosion of social media adoption (Facebook just announced that it hit 500 million members), Cognitive Surplus spends a majority of its focus the role that culture and psychology play in driving this new phenomena. The book starts off with a provocative opening chapter titled, Gin, Television and Cognitive Surplus — inspired by a similarly named speech and Shirky blogpost back in 2008. * In this initial chapter, we rewind back to London’s Gin Craze of 1720 where Shirky describes a city in the grips of a massive spike in gin consumption. Essentially, gin was cheap, easy to drink and most importanly, helped country folk who were working hard to assimilate into city living, “take the edge off.” What I like about Shirky’s gin example (along with many others in the book) is that he not only explains why the government’s proposed solution (making gin illegal) had little impact on the level of gin consumption but rather that it was the assimilation of rural folks into the urban population over time that ultimately reduced the reliance on gin. Throughout the book, Shirky uses other fascinating examples of “social” at work pointing cases like Howard Stern fans helping elect Hank the Angry Drunken Dwarf as People.com’s 1998 Most Beautiful Person and Georgia Merton and Penny Cross’s “couchsurfing” experience across Europe. What’s unique about Shirky’s style is that he gets at impetus of why people are doing these things, in many cases providing well-documented research by folks like research psychologist Edward Deci’s “Soma” experiment or professors, Güth, Schmittberger and Schwarze’s Ultimatum Game to explain what motivates people. At the end of the day, the reason I agreed to read and review this book is because I am an avid believer in the fact that while social media is not about tools or technologies. Instead it’s roots are grounded in a fundamental set of human behaviors that have existed for centuries… if not millennia, and these behaviors are now being shaped and changed by the availability of extra time — a cognitive surplus have you — and powered by new social technologies like blogs, wikis, Twitter and Facebook. Shirky drives hard on this concept in Cognitive Surplus and spends his time explaining the psychological and cultural drivers behind the phenomena. To me, it’s this approach that has a much better chance of resonating with senior management and thus might help them better understand why they should be embracing rather than eschewing social media. In summary, if I were to rate this book I would give it a solid A. It’s a quick read (just over 200 pages) and it’s chock full of new and exciting examples that help provide a better understanding of the “why” behind social media. It’s also a book that should appeal to both social media veterans along with marketing folks that are new to the space. If you want to buy the book (I don’t get anything if you do), it’s readily available at Amazon and Barnes and Noble. While this review barely scratches the surface what you’ll learn in the book, this 13 minute TED video from earlier this summer should help whet your appetite.